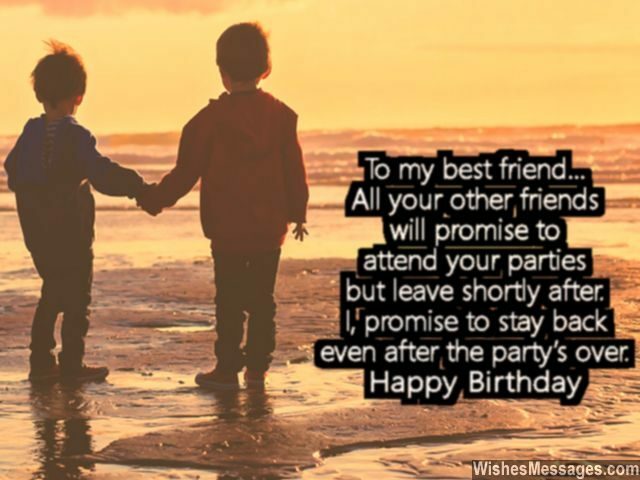 Birthday Wishes for Best Friend: A best friend’s birthday card deserves nothing but the sweetest wishes, cutest messages and the most touching quotes. Don’t you dare insult your friendship by picking up a lousy greeting card from the supermarket shelves. 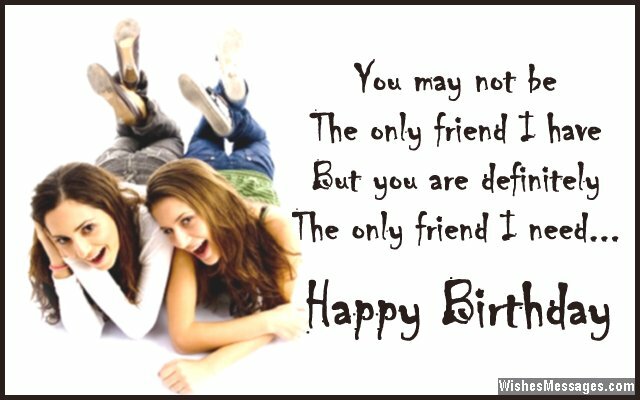 Wish your bestie a Happy Birthday by posting silly stuff on Facebook and tweeting funny rants on Twitter. Go on to Pinterest and share some of the best pins that you can find, especially those which embody the true meaning of friendship. Pen down a heartfelt line or two on a handmade note and slip it inside the gift that you got. And when you finally meet your bff in person on the special day, kick off the celebrations with smiles, hugs and high fives. This is the least you can do to celebrate the birthday of someone with whom you’re going to share some of life’s most precious memories. 9) Best friends like you are parents, teachers and lovers all combined into one magical personality. Happy birthday. 10) Finding your value in my life would be like finding water in the ocean – it’s always there. Without you, I would be empty. Happy birthday my friend. 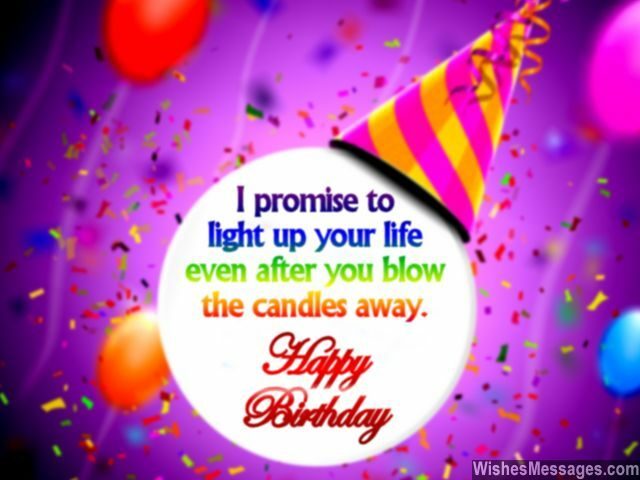 11) I promise to light up your life even after you blow the candles away. Happy birthday. 12) Just like how wine is incomplete without having something on the side to munch, without you my life simply does not pack a punch. Happy birthday to my best friend. 13) Cheesecakes, tiramisu and gooey tarts – may your life be as sweet as these goodies is the wish I make with all my heart. Happy birthday. 14) Thanks for hearing the words I never said, and understanding my mind which no one else has ever read. Happy birthday to my bestie. 15) When you are not around me I feel unlucky. With you by my side, I feel happy and free. Happy birthday mate. 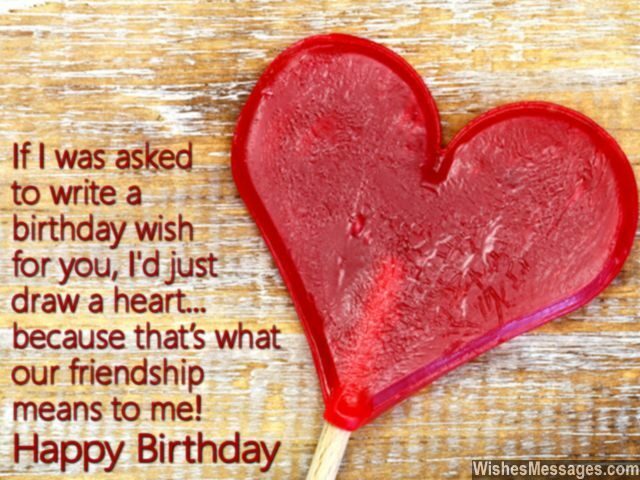 16) If I was asked to write a birthday wish for you, I’d just draw a heart – because that’s what our friendship means to me. Happy birthday. 17) Every minute I spend hanging out with you is more precious than gold, because it is a priceless memory that I am going to cherish when I am old. Happy birthday buddy. 18) I may not be an expert at being your best friend but I promise to try again and again till my dying breath. Happy birthday. 19) I do hope that your birthday cake is the sweetest one ever, but it can never be as sweet as our friendship. Happy birthday. 20) Just being around you helps me get more out of each breath. Happy birthday my friend, I will love you to death. 21) Your presence in my life is like the RAIN which parches thirst, creates a beautiful rainbow and always leaves behind a silver lining. Happy birthday to my best friend. 22) Happy birthday to the friend who stays in my heart permanently and rightfully refuses to pay rent. 23) The difference between you and my other friends is that they know me as a person, and you understand me as an individual. Happy birthday. 24) I want to thank you for not just being there for me when I needed you, but being there for me all the time. Happy birthday. 25) I wish every day was forty eight hours instead of twenty four. Then I’d spend more time with friends like you who I simply adore. Happy birthday. 26) All your other friends will promise to attend your parties but leave shortly after. I, promise to stay back even after the party’s over. Happy birthday. 27) Everyone can boast about being friends with people when they are likeable. But only best friends can boast about being friends with people even when are irritable. Happy birthday to one such bestie. 28) I don’t have a sister but if I ever did, she would have very big shoes to fill – YOURS! Thanks for being my best friend and my sister from another mother. 29) Whoever said that a dog is a man’s best friend obviously never met you. Happy birthday. 30) People who care for me as a friend are just friends. You are special, because you care for me as if you were caring for yourself. Happy birthday. 31) No matter where life takes us, no matter how far we are from each other – the memories of our friendship will remain in my heart forever. Happy birthday. 32) I wish that your birthday brings a new year as sweet, peppy and fiery as you. Happy birthday. 33) May your destiny take you to every single place that you have always dreamt of. Have an awesome birthday. 34) Happy birthday to the person who always reminded me of my worth even when I felt worthless. 35) Having you as a friend is like the warm feeling I get when I hold a hot coffee cup on a cold winter day and curl up with my favorite book on my sofa. Happy birthday to my best friend. 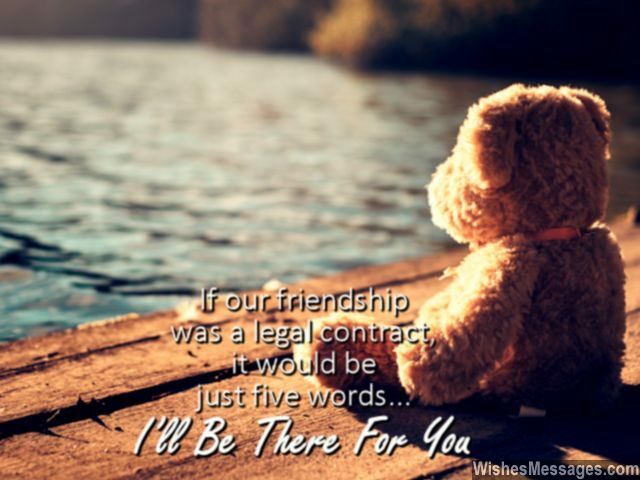 36) You may not be the only friend I have but you are definitely the only friend I need. Happy birthday. 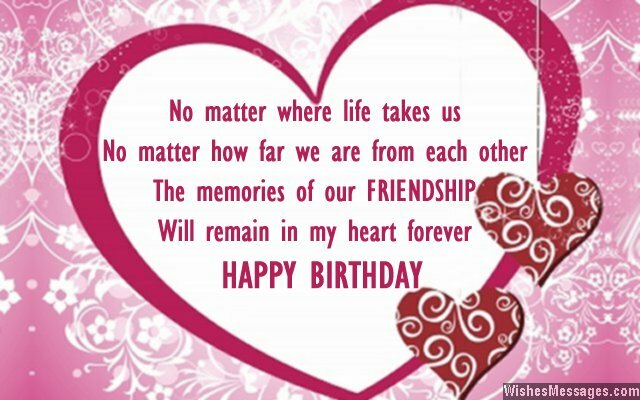 37) Your birthday has not just added a year to your life, but also to our strong friendship which has stood the test of time and strife. Happy birthday my friend. 38) The worst part about being best friends with you is that everything becomes boring as hell, when you are not around. Happy birthday. 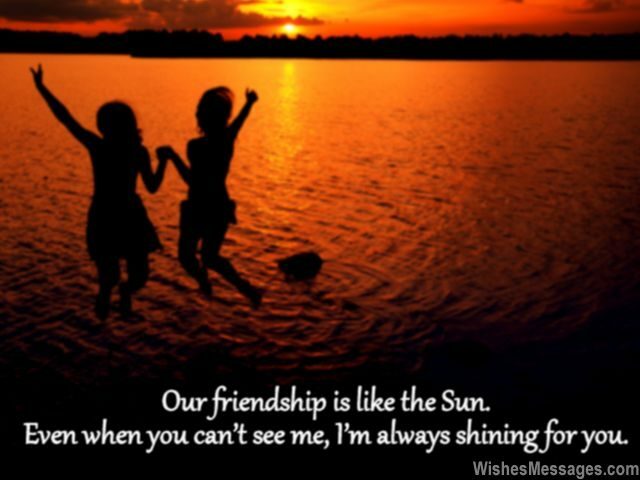 39) Our friendship is like a circle because it has no rough edges and no ends. Happy birthday. 40) We are less like best friends and more like twins – even your birthday feels like mine. Happy birthday.